I’m writing this post 17 September, which many pubs and other marketers with even the most tenuous connections to Ireland now promote as “Halfway to St. Patrick’s Day.” By coincidence, I was in Harrisburg, Pa., for some Irish research at the Pennsylvania State Archives (though not their Molly Maguires collection) and visited St. Patrick’s Cathedral on State Street, two blocks from the hilltop capitol. 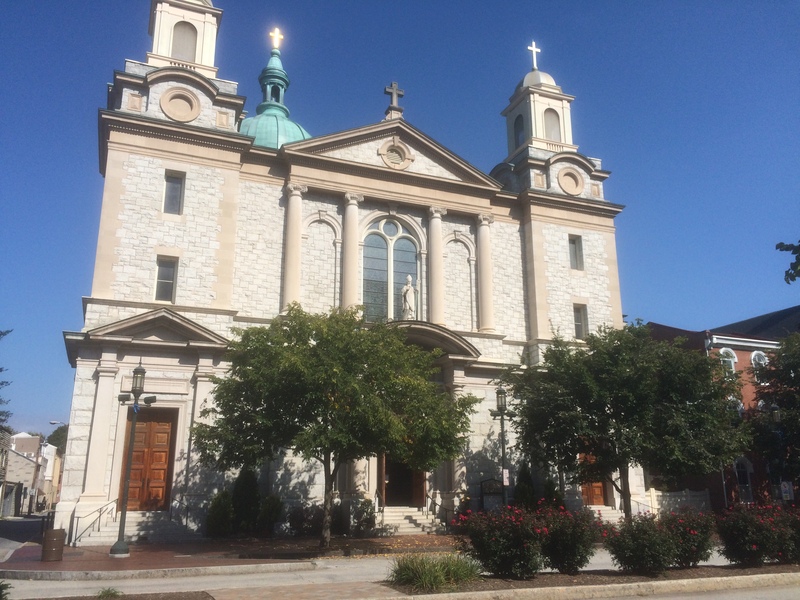 The parish and earlier iterations of the church date to the early 19th century, when the construction of a vast system of canals, railroads, and turnpikes along the Susquehanna River brought many Irish immigrants to the area, according to the cathedral’s official history. Construction of the present building began in 1904 and was completed three years later. The church was officially dedicated 14 May 1907, though liturgies began earlier in the year. The Ancient Orders of Hibernians, Division 5 in Harrisburg, gathered at the new cathedral for a 7 a.m. St. Patrick’s Day Mass, a Sunday that year, either inspiring or requiring extra piety. The fraternal group paid the $1,800 for the transept window of St. Patrick, holding a shamrock to explain the Trinity to the royal court at Tara. The men surely admired the beautiful stained glass from Munich, Germany. 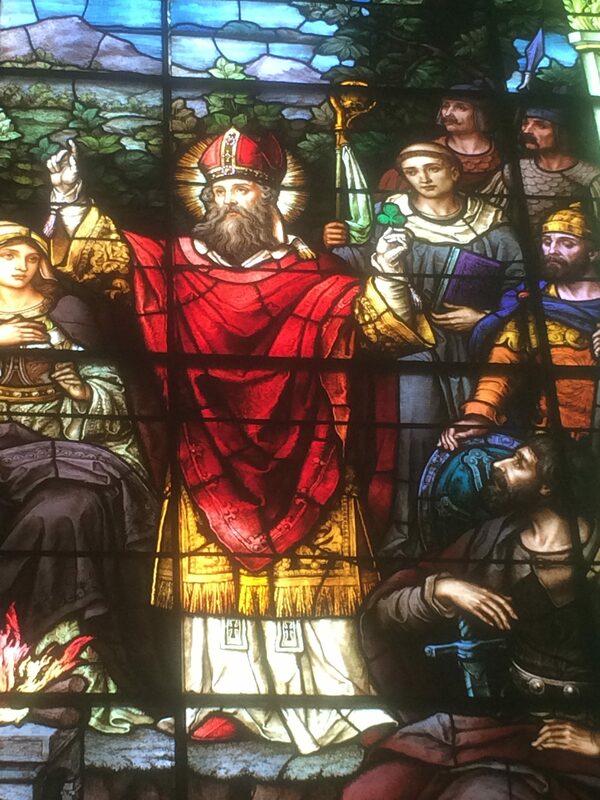 “The Apostle of Ireland is a splendid figure … arrayed in full pontificals, even to the gloves,” is how the Harrisburg Telegraph described the window in a story detailing the church’s architecture and amenities. But even the grand new worship space had to compete with the holiday’s contemporary commercialism. The paper detailed an array of tchotchkes such as high hats and pipes, “green pigs of every variety,” “clovers growing in pots” and boxes decorated with harps and green flags. The items sold for a few pennies to 20 cents. About 100 clerics attended the official dedication in May, including Archbishop P.J. Ryan of Philadelphia. He donated the exterior statue of St. Patrick that is mounted over the entrance of the church. Timothy Healy and William O’Brien were at the forefront of this latest split with Irish Parliamentary Party leader John Redmond. The Catholic Church hierarchy also rejected Birrell’s bill. Read more about this period of Irish history. St. Patrick’s Cathedral in Harrisburg is the 20th St. Patrick’s church that I’ve visited in four countries. See the list. This entry was posted in Arts & Culture, History, Irish America, Politics, Religion and tagged Molly Maguires, Sinn Féin, St. Patrick on September 17, 2017 by admin.